Shazam, shazam, shazam! The ancient DC super-hero, the only character that could ever possibly stand up to Superman, is coming to the big screen...eventually. Shazam is famous within the comic book universe because it was one of the first comics to place a child as a central character. 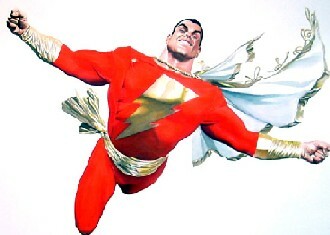 Shazam is the super-powerful, orange spandex-clad alter-ego of 12 year-old Billy Batson. Or that's the common misconception. Shazam is the word that Billy utters in order to turn into Captain Marvel; with that explanation it's easier to see why the name Shazam caught on and Captain Marvel didn't. See the latest developments for this project on the Shazam! Movie News page.